Steel Safety Toe meets I/75 and C/75 impact and compression ASTM F2412-11 and F2413-11 safety standards. Electrical Hazard Protection meets ASTM F2412-11, ASTM F2413-11, and ASTM F2892-11 standards to provide secondary underfoot protection against the hazards of stepping on live electrical circuits, electrically energized conductors, parts, or apparatus. Steel Puncture-Resistant Outsole meets PR puncture ASTM F2412-11, ASTM F2413-11, and ASTM F2892-11 safety standards and features a steel plate designed to minimize the likelihood of puncture wounds caused by sharp objects that could penetrate the sole. The Timberland PRO® Endurance collection was designed and engineered specifically for workers who spend long hours on their feet. 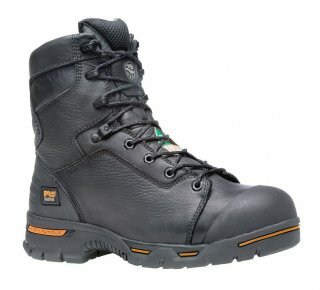 Built to protect feet and enhance safety in a wide variety of jobsite conditions, this steel toe work boot features waterproof leather and construction, warming insulation, and exclusive anti-fatigue technology incorporated directly into the midsole for all-day comfort. A Steel-Flex® puncture-resistant plate offers further protection, and the Timberland PRO® rubber outsole resists slippery areas and abrasions and features the Ladder Lock™ outsole radius to help keep secure footing on ladders.